It’s always amazing how, with just a few pieces of information, you can open up a new understanding of a single topic. With this dashboard snapshot, I could see which of my articles had performed the best, which were the worst. I could determine how many total views my articles had received, and a bit about the overall engagement I have with my “audience”. I don’t have hundreds of thousands of views on any article. In fact, I average about 1,000 views for each one published. But what is wonderful, is that engagement number, 22% of people who “Liked” the article, took the time to actually comment on it. That means, for every 1,000 views, there is an opportunity to engage with 12 to 14 people – I’ve published over 85 articles – that means if each of those views were unique. 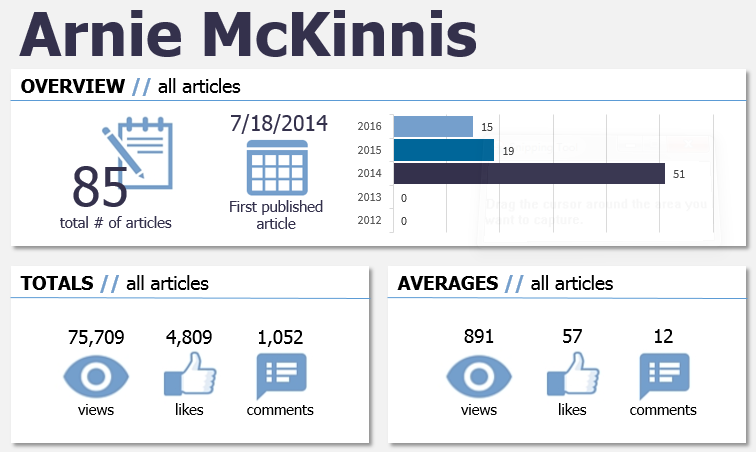 I could have created just over 1,000 personal engagement points over the past two years! Even if there are only 25% unique, it provides a touch-point for those 250+ people. And in the world of marketing, sales and business development, touch-points help build trust, which helps build relationships, which in turn provide the opportunity to increase your personal brand or that of your company’s. Is LinkedIn the only publishing platform? No. There are some who believe the engagement (views to comments) is being strangled based upon LinkedIn’s algorithm (what each of us actually see in our update stream). I won’t argue some of those facts or opinions. With over 400 million profiles and 50 million active monthly visitors, LinkedIn is at the present time, the Big Dog in business networking – it may change as Microsoft takes over the company, it may change for the better or worse, right now that’s only opinion. Are there any alternatives? Yes. There are multiple ways to make content work for you – and each of us are comfortable with different levels of engagement, sharing and creation. The key is finding your own voice – or combinations of voices – allowing you to fully engagement with people, many of like mind (some that only enjoy debating). What else could you do? Plenty. There is also the alternative of using LinkedIn as a “sharing” platform, much like Twitter. For some users, their updates create much more engagement than writing, and it’s very easy to share updates, news, etc. to your network. Most major content sites provide the ability to share to LinkedIn, along with whatever additional commentary you choose to add. Another tactic is to only publish excerpts of your original articles with a “READ MORE” link. I know (and am connect with) many people using this tactic to increase their website traffic, gain new followers, add to their contact and mailing lists – any number of interesting way to use LinkedIn as a jumping off point. ability to lead people to an action (called a CTA/call to action). With those two things, you can turn a few hundred readers into a few hundred new contact for your company, product or service. The old saying “Content is King” is still very valid. It is more important than ever to create content based upon your own level of comfort – keeping in mind interesting content will always be valuable, boring content will continue to be background noise. 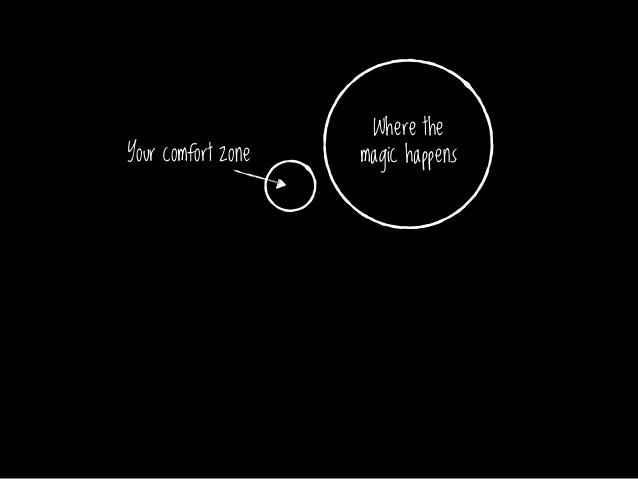 Your goal then … is make interesting content, try new channels, and investigate new ways to engage with your audience. My little dashboard experiment helped me to understand more about the content I’ve written over the past couple years on LinkedIn. And it has opened my eyes to other channels and methods – along with the possibility of creating a larger audience with multiple engagement points. An article doesn’t have to live its full life as only a single LinkedIn article. 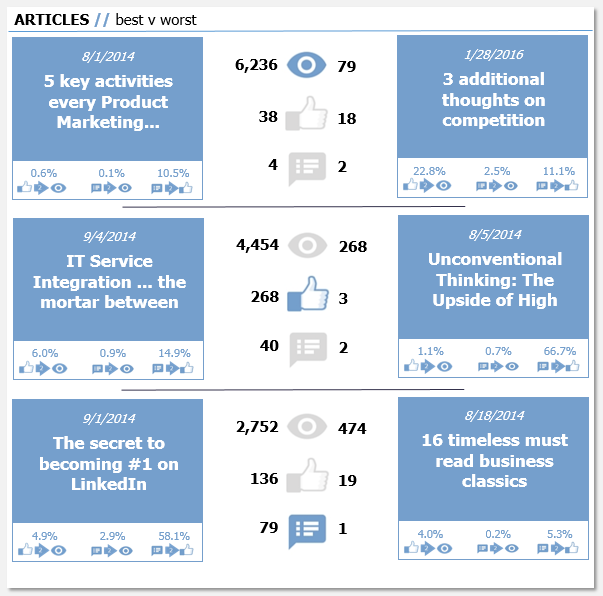 There are many tactics to share those LinkedIn articles and create additional engagement. I’ll be writing more about the dashboard, if you’d like to understand more about it, and possibly get your own, check out the webpage: LinkedIn Publishing Dashboard. Other ways to engage? with me. Like or comment this article. Share it on Facebook, Twitter or LinkedIn. Take the ideas and write your own article (you could even link back to this article). You can also email me (it’s on my profile page) or visit my website. All of those are outstanding options. I help companies market their products – I let the branding experts do their best work with your company, but believe success is driven by the products and services you deliver to your customers. I call it Professional Product Marketing – even if you only have one product, it’s worth the effort. Let’s chat.